For decades, East Los Angeles had one high school that was built to serve 1,500 students and instead housed more than 4,700. The high school ran on a year-round academic calendar with students divided into three tracks to accommodate the overwhelming enrollment. As a result, students lost 17 academic school days per year. 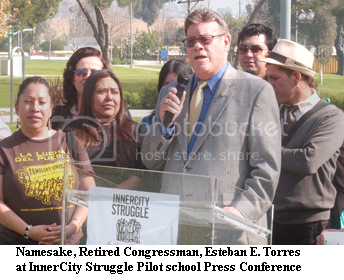 InnerCity Struggle's tireless efforts in organizing the East LA community to urge the Los Angeles Unified School District (LAUSD) to alleviate the over-crowding to increase graduation and college-going rates of local youth led to the opening of the much needed new high school. Long before the organizing effort, a group of LAUSD teachers were participating in the Humanitas program led by the Los Angeles Education Partnership. For two decades Humanitas has helped teachers develop inquiry-based interdisciplinary approaches to instruction. These approaches engage students in challenging learning experiences organized around relevant arts and humanities themes and encourage critical thinking, writing, and verbal skills. Humanitas teachers and students form close relationships that support student learning, and teachers improve their knowledge and skill through ongoing collaboration with their colleagues. 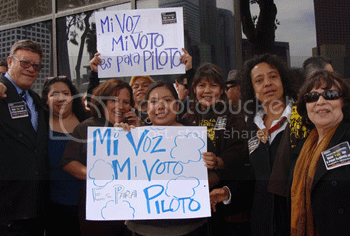 The interests of InnerCity Struggle and LAEP converged when LAUSD set in place a public school choice policy focused on the type of groups that could run new schools, just as the new Torres campus was nearing completion. This policy allowed organizations from inside and outside LAUSD such as charter schools, education organizations, LAUSD administrators, and teachers to apply to run schools. Encouraged by their shared experience with Humanitas, groups of teachers proposed to run five small high schools on the Torres campus. With the support of LAEP, teachers worked many late nights to complete their applications. Influenced by the success of LAEP's community school work in the San Fernando Valley, the teacher teams combined Humanitas and community schools concepts in their applications -- embracing a holistic school operational framework concept. InnerCity Struggle's base of community members and youth were invested in ensuring Torres opened with a rigorous model focused on college and career preparation. InnerCity Struggle mobilized broad community support in an Advisory Vote for the high quality application prepared by LAEP and the Humanitas teachers, including securing support from civic leaders, CBO leaders and most notably the namesake of the school, Retired Congressman Esteban E. Torres, who all committed to support the school's success; other proposals received little support. The LA Board of Education approved the plan. In the fall of 2011, the Torres campus opened with five independent academies of 500 students each focused on performing arts, engineering and technology, social justice leadership, arts and technology, and urban planning. The Academies embody the Humanitas approach and offer students a robust college preparatory curriculum that expands learning beyond the classroom and connects students with real world learning experiences. The East Los Angeles Performing Arts Academy, for example, works with the LA Repertory Theater, LA Opera, and the Shakespeare Theater of Los Angeles among others. Students at the Humanitas Academy of Art and Technology have been working with staff at the Huntington Library, Arts Collections, and Botanical Gardens to capture their everyday lives in East Los Angeles through photos, painting, and other media. The Engineering and Technology Academy is working with local community colleges such as East Los Angeles College, to provide students with access to STEM careers and education. The Social Justice Leadership Academy is working with local non-profits such as Farmscape to address local social needs such as access to healthy food. The East Los Angeles Renaissance Academy introduces its students to urban planning concepts and works closely with private firms such as Gensler Architecture in order to give students first hand experiences. But the founding teachers at Torres and their allies at the Los Angeles Education Partnership and InnerCity Struggle knew they had to go beyond academics to help students succeed. The challenges of low-wage working families, health and wellness, and gang violence could not be ignored. Their applications envisioned a campus wellness center operating through partnerships with Bienvenidos, a community-based mental health agency with additional support from the California Hispanic Commission on Alcohol and Drug Abuse and Hillsides. The community school model is beginning to effectively meet student needs beyond the classroom through relationships with more than 20 other agencies in the neighborhood which address hunger and nutrition, social services, adult education, and numerous other student, family, and neighborhood needs. Torres High School chose to have a full time community school coordinator, employed by LAEP, who works with all five schools, InnerCity Struggle, and many other partners to ensure the engagement of parents and the community and the alignment of school and partner efforts. Students are part of the solution at Torres, too. Juniors and seniors founded the Torres Mentorship program to create positive change in their school, home, and community. Students identify needs and work in collaboration with adults involved with the school to ensure that all Torres students are healthy in body and mind. Summer freshman orientation, voter registration, cancer awareness, and mentoring at nearby elementary schools are among their activities; and, they plan to engage more students. In addition, parents have organized themselves into a council that is focused on how they can support student success across the various school sites. Esteban Torres is only two-years-old, so we'll hear more about longer term results for students and the community. For now, in one example, East LA Academy for Performing Arts at Torres graduated 86 percent of its seniors in 2012, despite the fact that 70 percent of the class had arrived at ELAPA two years ago when it opened without sufficient credits or with a D or F in a college-required course. Sixty percent of the graduates were eligible for University of California or California State Universities. In the meantime, Torres is a testament to what is possible when school and community leaders work together and create a beacon of hope and opportunity for students, their families, and an entire neighborhood. It has taken advocacy from InnerCity Struggle, LAEP and school board champions such as Board President Monica Garcia to make this vision become a reality. We need more collective action like this to improve our schools.